Marianka is the end of the road. I certainly felt that when I traipsed into this pretty village nestled into the forested uplands of the Malé Karpaty recently – having just completed the path through the hills from Bratislava by which the pilgrims typically arrive to this, Slovakia’s main pilgrimage destination. It hardly seems possible that Marianka, with its isolated feel, is in essence a district of Bratislava connected to the city transport network and a mere 90 Euro cent ride from the city centre’s Most SNP bus station. But perhaps the sense of isolation originates not just from the fact that the narrow road up from Záhorská Bystrica finally dies out here, to be smothered by the rows of pine trees sheering away above the village, nor the fact that on my first visit, the metre-deep snow everywhere emphasised the otherworldliness of Marianka’s surrounds. Perhaps Marianka does have that special, unique feel of a place that has grown up independently of anywhere else and anything else except, well, faith. Not only is this Slovakia’s biggest pilgrimage destination, it is also the oldest. It ranks up there with Central Europe’s most important pilgrimage sites, in fact. The spiritual history of the place dates back almost a millennium. Historical records of Marianka being a pilgrimage site can be traced to 1377. In this year, one Louis of Anjou, attracted here by rumours of healing waters and of a wooden likeness of the Virgin Mary with special curative powers, decided after he had clapped eyes on Marianka, to build a chapel in which to house the wooden Virgin. But the rumours that enticed Louis of Anjou go back several hundred years further: to a hermit who resided in the valley here in the early 11th century and carved the Virgin out of pear wood. This Holy man subsequently had to leave the area in a hurry because of riots in the Kingdom of Hungary (there were many at the time) and hid his handiwork in a hollow in a tree. For decades the Virgin remained lost. After some time, so goes the most colourful version of the story, a local crook, despairing of his severely handicapped children, vowed to change his ways if he received some sign from the Lord that his fortunes would change. He was told of the whereabouts of the Virgin whittled from pear wood, and found her resting right on top of a spring of water which when applied to his children miraculously cured them. The outlaw did change his ways, and devoted the remainder of his life to God. 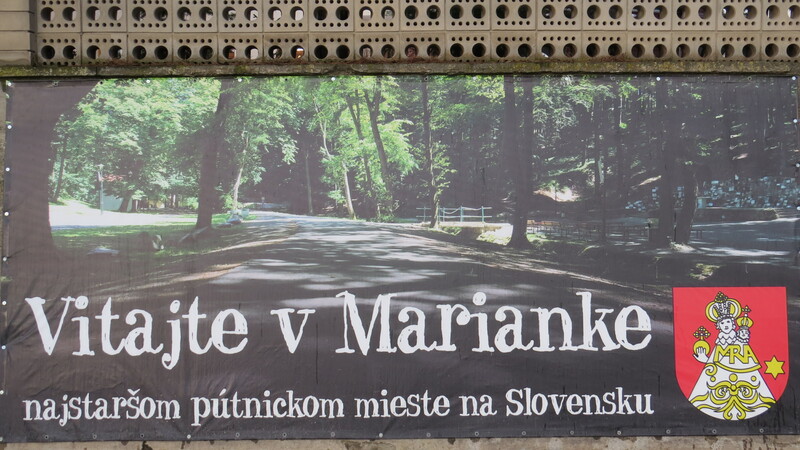 When you arrive in Marianka, just after this sign appears on a wall to the left, the village’s main pilgrimage site rears into view below the road: the vast former monastery, now a lodging house for weary pilgrims, and behind it the Gothic-Baroque Church of the Nativity of the Virgin Mary, built originally in the 1370s. 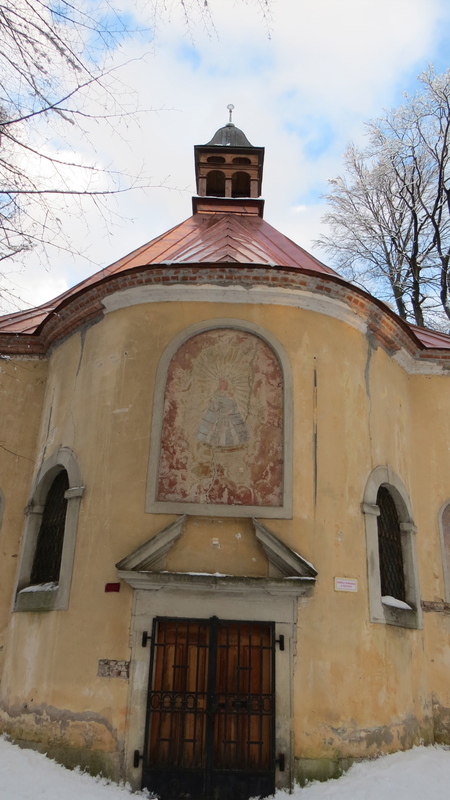 Most Ornate Church in Slovakia? Inside the pastille yellow building, the first reaction is one of surprise: the weary pilgrim is ushered into a far-from miraculous antechamber with a guestbook on a bench and little more. Then you round the corner and enter one of the most stunningly decorated churches in Slovakia – for me one that easily eclipses even the mighty dome of St Martin’s Cathedral in Bratislava (although not the wooden churches of the far east). 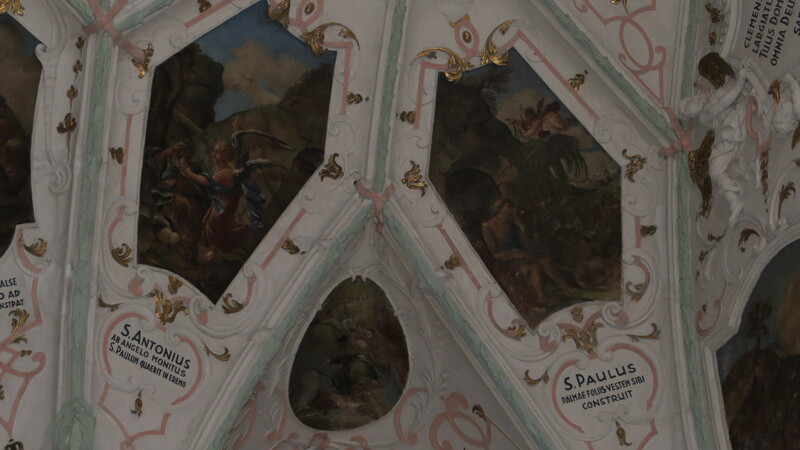 It is the ceiling decoration that transfixes you: richly-painted depictions of scenes from the lives of the Saints – Sts Paul and Anthony feature prominently – in a striking arcing montage of gilt-edged panels. Shrines flank the sides of the church and on the altar at the far end is – so they say – the wooden Virgin as fashioned by that hermit all those centuries ago. It’s a place to sit in, for some minutes, gawping up at the view. Outside in the churchyard the Chapel of Santa Anna (1691) sets the tone for the six smaller Temples to the Virgin – ushering the visitor up a tree-lined lane to the round Chapel of the Holy Well which is allegedly built on the site of the spring of water with the rejuvenating powers. On the other side of the processional route to the Chapel of the Holy Well, some five other shrines, more haphazard and less refined in design, but with the flickerings of a myriad candles rendering them equally poignant places of worship. Most moving of these is the calvary, on the right as you approach the Chapel of the Holy Well (pictured above). Hidden away in the steep bank behind the temples to the Virgin, what you initially mistake for another shrine transpires to be a 17th-century mine shaft – the only remaining example of black shale mining in Slovakia. The shale was discovered during construction of the temples, and extraction continued until the First World War – Marianka shale became a highly-prized material. It is incredible to think that a place that not only provided one of Central Europe’s most important pilgrimage sites – a place visited by Hungarian emperors from Leopold I to Maria Theresa to Charles III – but also some rather crucial roofing material for the valley, should have been slated for demolition under Communism. Equally incredibly, Communists never got round to executing the plan, so the very fact of Marianka’s survival is something of a miracle. Pilgrims get hungry on the long march, and there are a couple of good places to feast in town. Right by the bus turning circle is Pútnický Mlyn (pilgrim’s mill), the fanciest restaurant with a modern decor and an outside terrace with a mill wheel (they also offer accommodation) and a few paces up from the turning circle on the red trail is a decent bistro. But far and away the best eatery is Hostinec U Zeleného stromu (the Green Tree Hostelry) which has a history of accommodating tired pilgrims going back centuries. It’s the most atmospheric option, too: somehow, a pilgrim’s watering hole should be old, with worn walls, dim lighting and a grave old bar lady that has been working there so many decades she appears part of the creaking furniture – no? There are two parts (both extremely popular): a restaurant and below a bar, all done in the style of an old wine cellar that could have stood in as the set for the Prancing Pony in Peter Jackson’s Lord of the Rings trilogy if required. It’s open for ridiculously reasonable food and drink (one Euro for a good frothy Bernard beer) from 11am to 10pm daily, and has rooms too. From the entrance road to the monastery, church and shrines, a signed trail (red) heads up on a narrow lane into forest, going via Borinka to Pajštún Castle in about 1.5 hours. Up above town, red intersects with yellow at a woodsy spot called Klčovanice. It’s worth the deviation here (almost two hours longer to reach Pajštún Castle) to forge on the blue path through along to Svätý Vrch (Saint’s Mountain) – then steeply down and as steeply up again to Dračí Hrádok. This is another significantly more ruined castle (only a few mossy stones of the outer walls remain) but it’s nevertheless a moving place, sequestered away in trees that have reclaimed the fortress for themselves. From Dračí Hrádok a yellow trail corkscrews steeply up to Pajštún. Starting early, there’s time to get the bus from Bratislava’s Most SNP, see the Marianka pilgrimage sites, lunch in Marianka, hike up to Pajštún and return from the castle to Stupava, from where there are also buses back to Bratislava. MAP LINK: We’ve kept the map panned out so you can see the road heading north from Bratislava via Záhorská Bystrica (and eventually on through the Záhorie region to the Czech Republic). GETTING THERE: Bus 37 runs every two hours from Most SNP to Marianka. MARIANKA VILLAGE WEBSITE In Slovak, but could prove useful. NEXT ON THE JOURNEY: In addition to the pilgrimage route from Bratislava, we recommend two great hikes from Marianka: the route north up to Pajštún Castle (1.5 hours) or the route east to Svätý Júr via Biely Kameň (4 hours).